New permanent teeth are 50% more vulnerable to damage than adult's teeth and can take up to 3 years to reach full strength. 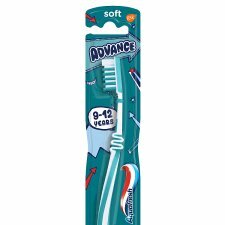 Our Aquafresh Advance toothbrush is specially designed by dental experts for children 9-12 years. It has soft bristles with different lengths to help clean the new permanent teeth and existing milk teeth and gently remove plaque. Abusive/excessive bending may break the neck of the toothbrush. Do not allow bristles or toothbrush to be chewed. It is recommended that toothbrushes are replaced every 3 months. If used by children under 6 years, they should be supervised during brushing.